Many Haitians use these services to communicate with family and friends in Haiti and around the world... I know many people who use Tango, WhatsApp, and other services to stay in touch over long distances... So what happens now? 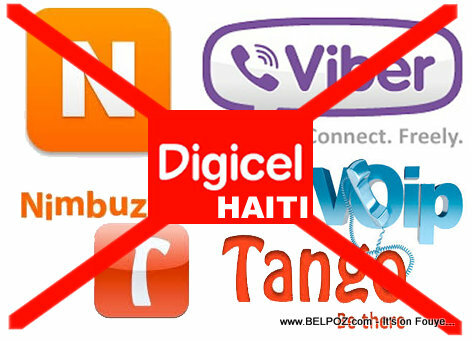 According to Haiti news reports, Digicel said that as of midnight June 17, 2014 some VoIP services like Viber, Tango and Nimbuzz have been blocked on its network. Are you a victim of this Digicel decision? Do you agree with the decision by the Haiti mobile phone companies and Internet service providers to BLOCK Voice over IP (VoIP) in Haiti? The government is responsible for letting digicel thinks that it can have a monopoly in the country. I think this is a stupid decision that digicel ever made because lot of people will leave their company for something better. The reasons given do not stand.